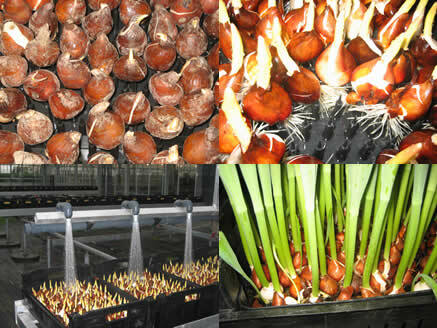 Other bulbs can also be forced on water. 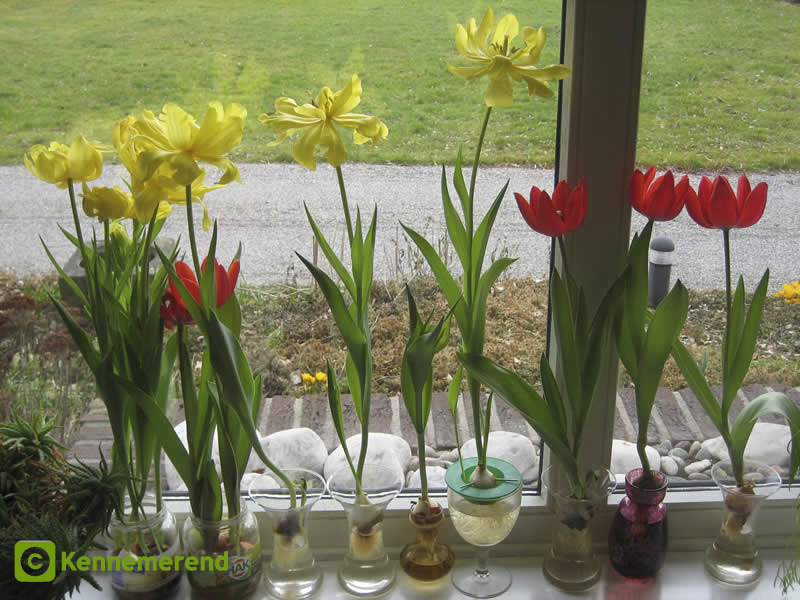 Most spring flowering bulbs can be forced on water in the winter, provided the vase or glass will give enough support to the developing plant. The advantage of spring-flowering bulbs is that they do not need very much light in winter to flower. The energy necessary for most flowers to come to flower is in the case of these bulbs gathered in the bulbs in the preceding growing season and enables them to come to flower easily. 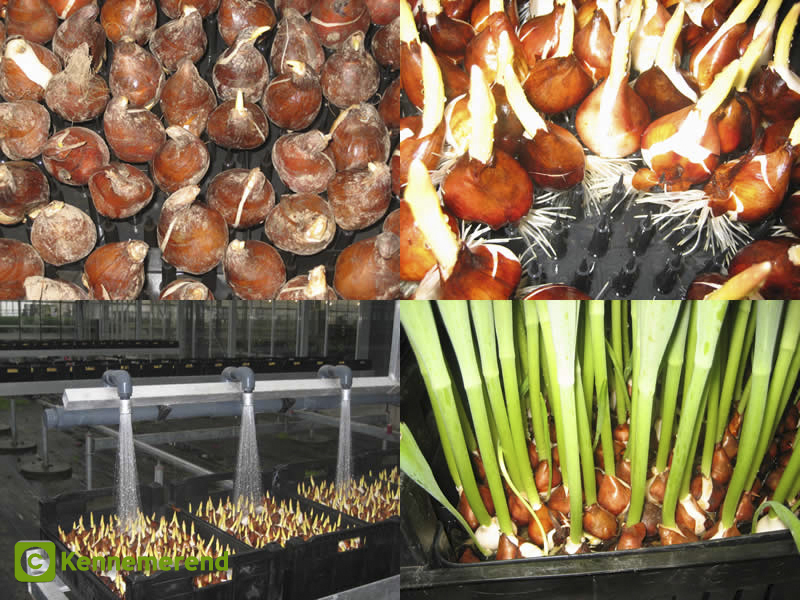 The bulbs are literally filled with energy and in autumn most bulbs already carry inside them the fully-developed plant. 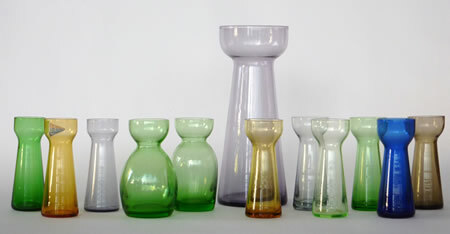 Crocuses have successfully been grown on the specially-developed crocus-vases. Best results are with the big flowering white, striped and blue crocuses. The yellow crocus is possible, but only from February. 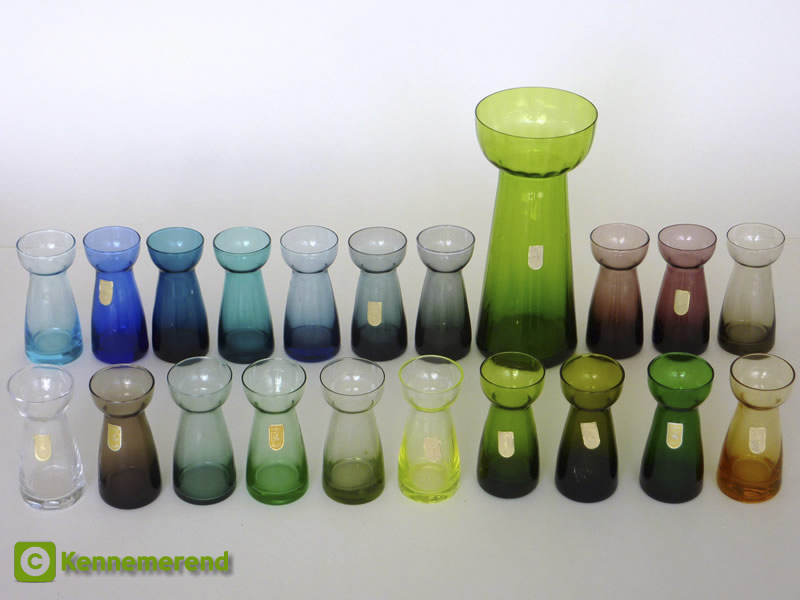 Various crocus vases from different countries with one hyacinth vase for comparison. Also forcing of tulips on water indoors is quite possible and some models of tulip-vases exist. Professional tulip forcers in Holland produce some 90 % of all the tulips for the production of cut-flowers by forcing on water! Other spring-flowering bulbs that can be forced on water are Narcissus (daffodil), Galanthus (snowdrop), Iris reticulata and other small irises, Muscari (grape-hyacinth), Puschkinia scilloides and Scilla species. Most of these bulbs you will have to give a cold-period of 12 to 14 weeks, before bringing them into the heated part of the house. 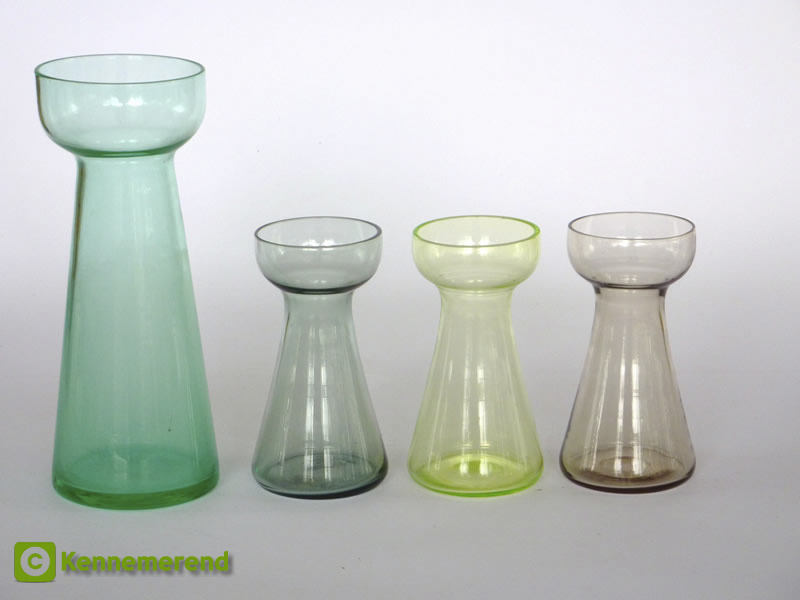 4 Different types of crocus vases of Leerdam – Holland. 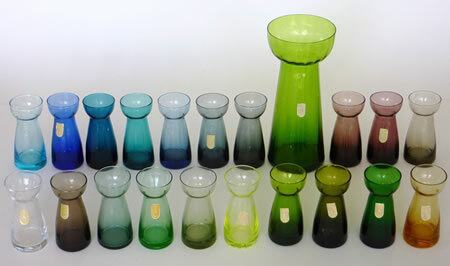 The rounded green ones differ in shape and are quite rare. 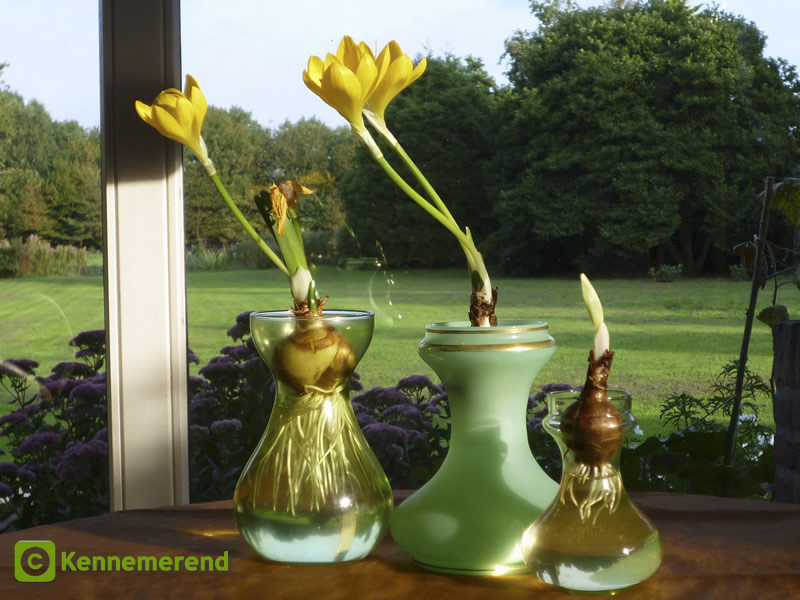 The Leerdam hyacinth vase is for comparison reason. Bulbs that do not need a cold period are bulbs that originate in warmer regions of the world. 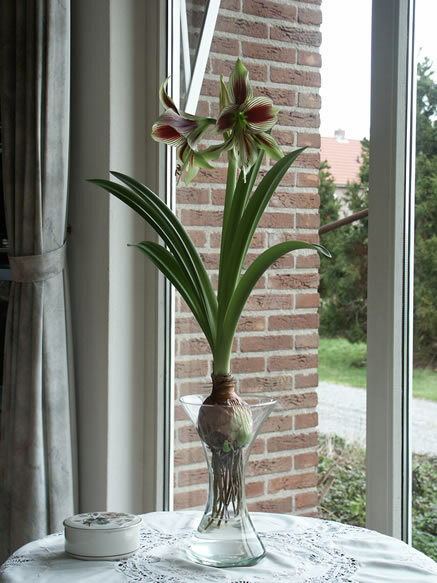 Examples are Hippeastrum (Amaryllis), Narcissus tazetta (Paperwhite) and Sternbergia lutea. When forcing, give them enough light to prevent plants becoming too tall! 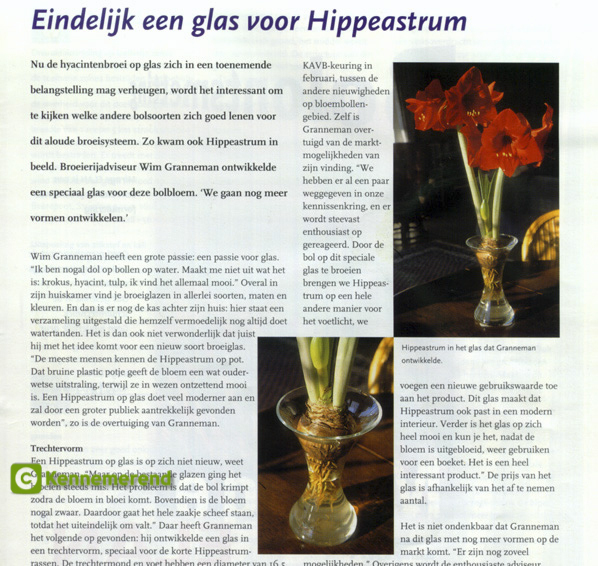 For Hippeastrum I developed a special vase, in 1997, to provide constant support to the shrinking bulb, through a special trumpet- shaped cup. 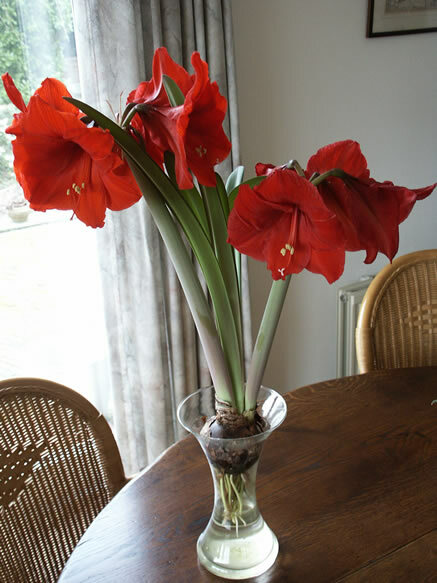 When you want to force Hippeastrum (Amaryllis) on water, choose short varieties, remove a part of the roots and all dead roots, wash the bulbs and refresh the water several times! 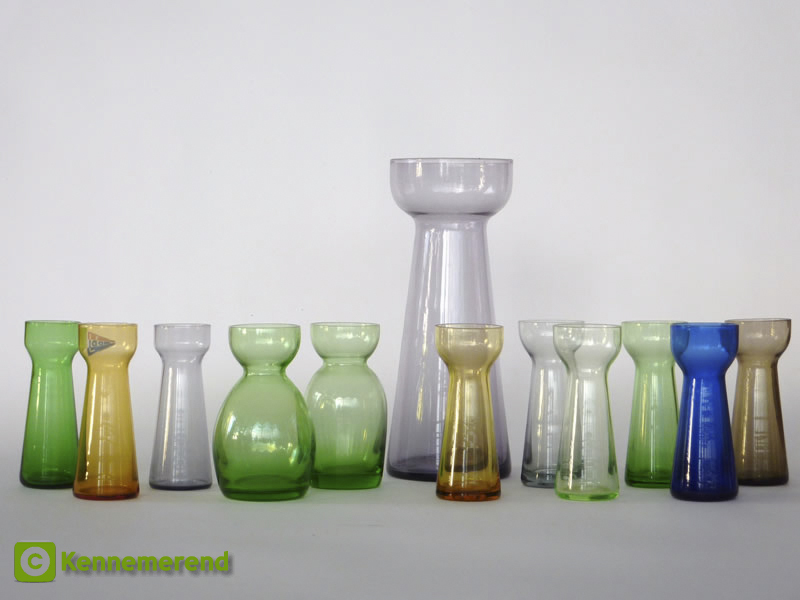 20 Different colours of crocus vases of model Jolly of Rimac - Holland. The Rimac hyacinth vase is for comparison reason. 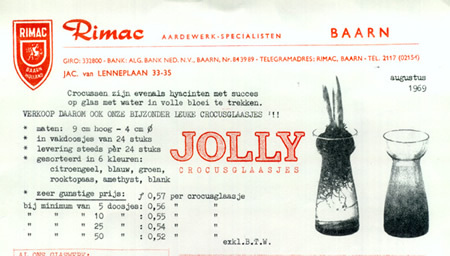 A copy of the 1969 sales brochure of the now defunct wholesale company Rimac presenting its crocus vase (model Jolly). Also less know flowerbulbs can be forced on water, like Sternbergia lutea. Right: Maastricht Kristalunie - Holland crocus vases. Left the Maastricht hyacinth vase for comparison reason. 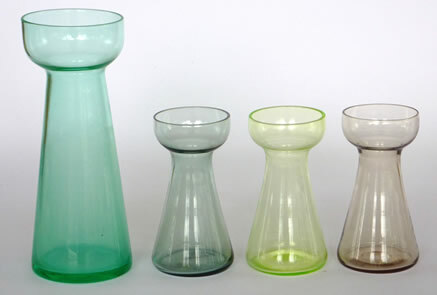 Both were designed by Roozendaal in 1939. Because of their size, these crocus vases are no very suitable for crocuses and are better to be used for bigger bulbs like tulips or daffodils. Amaryllis ( Hippeastrum) bulb forcing on water was always difficult because the bulb with the developing plant easily falls from the vase. In 1999 I developed a special vase with a trumpet shape that gives the possibility to maintain the support to the shrinking bulb. Amaryllis ( Hippeastrum) 'Papillio' on the Amaryllis vase. 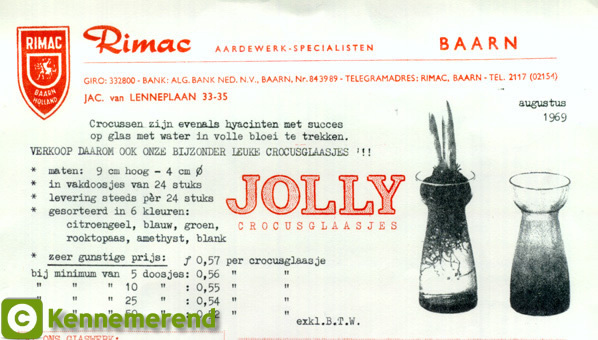 Professional forcing of tulips for cut flower production in Holland is for 90 % carried out on water! 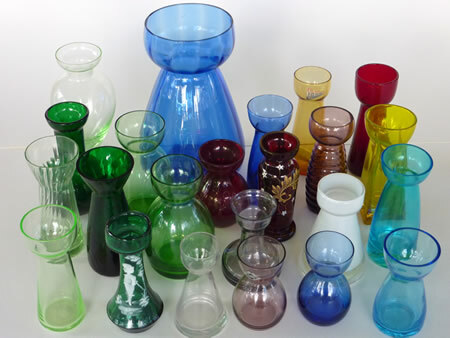 Tulips can in principle be forced on all kind of glass vases and jars!